PIOMAS Volume Melt Slowed in May, Too Soon to Implicate Negative Feedbacks. 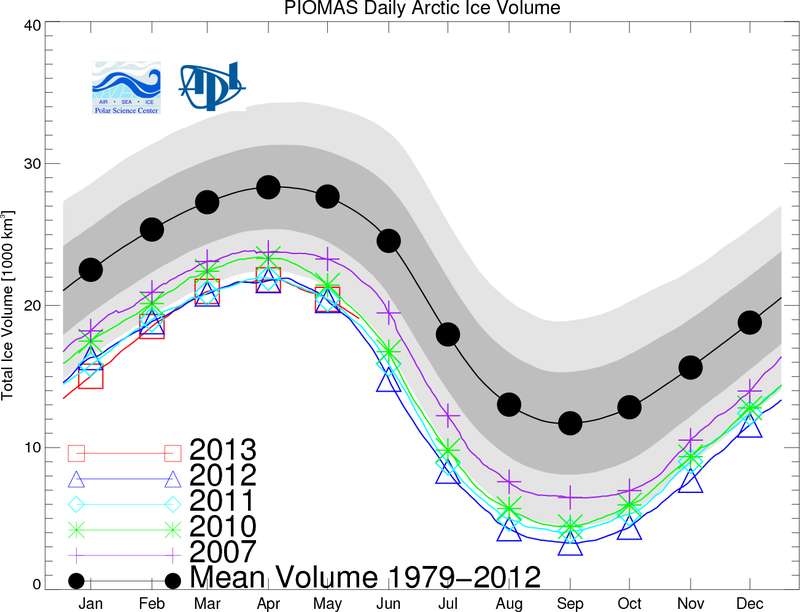 A slowing in sea ice area and extent melt during May has born out in the PIOMAS volume numbers. According to the most recent PIOMAS update, pace of Arctic sea ice volume melt remained about level during mid-to-late May. In past record melt years, 2011 and 2012 volume melt picked up by the end of May. As a result, sea ice volume has edged away from record low territory and is currently the third lowest in the measure. It’s a number still quite close to record lows, sitting about 900 cubic kilometers above 2012 values. But closer yet is 2010, the 4th lowest year, which was about 200 cubic kilometers above 2013 by end of May. It is also worth pointing out that Greenland and the Central Arctic above the 80th parallel has been somewhat cooler than average this May, despite large regions of substantial warming present in other areas. Whether this trend persists and whether it has an impact on melt for 2013, will be more readily apparent as June progresses. A prolonged slow-down in sea ice volume melt would also begin to beg the question: have negative feedbacks started to emerge in the Arctic? Large influxes of fresh water from Greenland have been flushing into the Arctic since the early 2000s. So one wonders if such high volumes of cold, fresh water could be involved in rejuvenating the Cold Arctic Halocline (CAH) layer while at the same time pumping colder water into the North Atlantic. In the Antarctic, scientific research has shown that glacial melt on the Antarctic continent has provided a cold layer of protective water which, in turn, has made the sea ice more resilient there. So if 2013 melt does slow and we get a trend of slower sea ice melt years to follow, it will be worth investigating if such a negative feedback is currently active in the Arctic. An increasing pace of northern hemisphere ice sheet melt has also been implicated in past climate swings. The Younger Dryas period occurring about 12,000 years ago was initiated by the breaking of an ice damn in the Laurentide ice sheet which covered a large portion of North America. This ice damn collapse flooded cold water into the North Atlantic which initiated major swings in climate — setting off a period of colder temperatures that lasted for about 1,000 years. Geological observations of such a large infusion of cold, fresh water provides an example of how large volumes of melt water can act as a negative feedback and cool the climate. Present day Greenland melt is substantial, averaging about 500 cubic kilometers per year, though certainly not as substantial as what occurred during the Younger Dryas. Nonetheless, Greenland and Canadian Arctic Archipelago glacial melt is likely to have an impact on both sea ice and climate as melt rates increase. This will be something worth looking at if volume melt continues to slow and cooler conditions begin to persistently crop up in the Arctic. At some point, human greenhouse gas forcing is likely to achieve such an event. 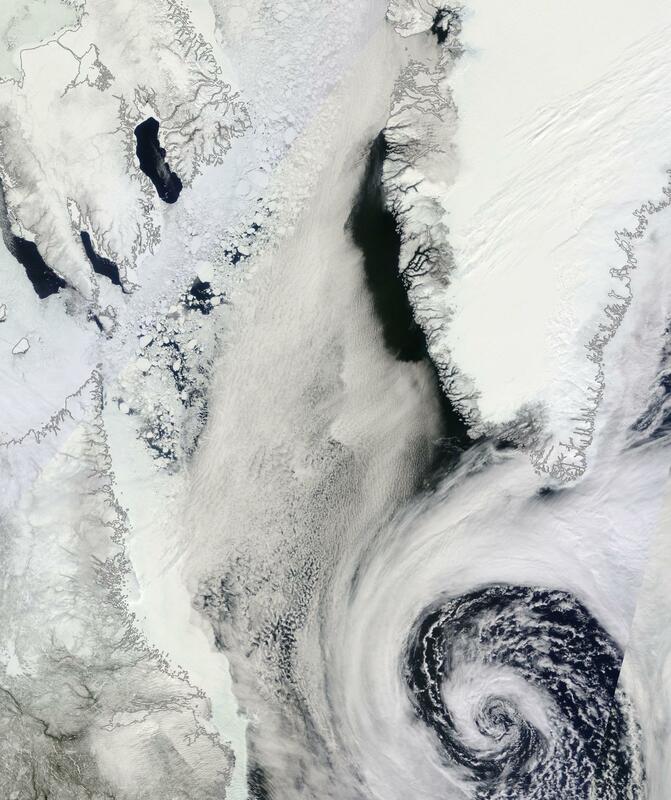 When this happens, Arctic temperatures are expected to cool even as warming increases in the lower latitudes. The weather consequences for such an event are quite dramatic (a subject worth exploring in another blog). All that said, the above is purely speculative and we would have to see a more consistent slow-down in volume melt as well as a regime of cooler Arctic temperatures to validate such an occurrence. 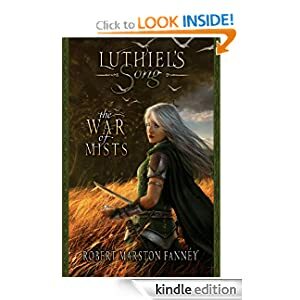 So it is worth emphasizing that we are not out of the woods yet. One month of slower than blindingly fast volume melt in the context of some of the thinnest ice on record does not a trend make. More ice volume remains in areas outside the Central Arctic Basin and so will be more vulnerable to mid-to-late-season melt. 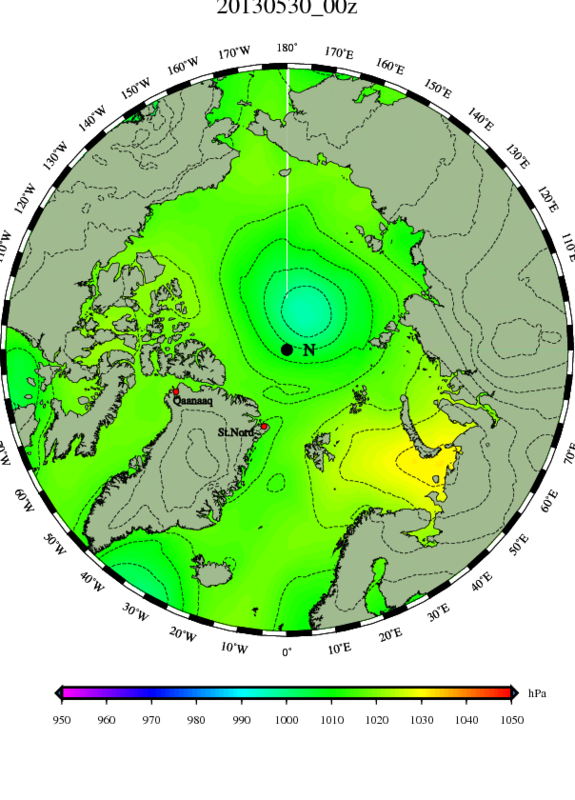 In contrast, Central Arctic ice is much thinner than usual, also making it vulnerable. So volume numbers will be more telling once we start getting substantial melt in Hudson Bay, Baffin Bay, and the Kara Seas. Speculation for a major June melt, for various reasons, is running particularly high (An interesting and well-thought-out take is that of Chris Reynolds over at Dosbat.). This fragile state makes end of June PIOMAS numbers an important indicator. If temperatures are cool, the edge ice stays more resilient, the central ice is able to hold together under the pounding of our Persistent Arctic Cyclone (PAC) of 2013, and the pace of overall melt remains slower as volume numbers remain somewhat higher by end of June, then it becomes a bit less likely we will see another record year in 2013. Were such an event to occur, we’d have to revise our end-of-year melt risk estimate downward. We are still in record low territory. June is a volatile month. And we have the PAC of 2013 as well as the potential emergence of warmer waters from the depths to contend with. So June is likely to be a very, very interesting month. The November update of the Polar Science Center’s PIOMAS sea ice volume tracker shows Arctic sea ice volume remaining in record low territory for the month of October. By month’s end, sea ice volume was still about 1096 cubic kilometers below the previous record low set in 2011. Volume recovery during the seasonal re-freeze was lower than in 2011. During that year, sea ice volume in fall and winter rebounded to levels near those of the previous year. This year, however, the gap between 2011 and 2012 is much greater. 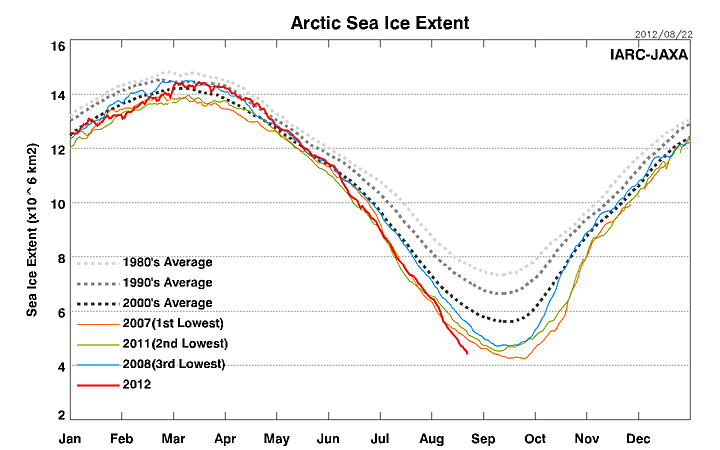 A number of factors kept Arctic re-freeze lower than in previous years. Sea ice has been pushed so far back that it simply takes longer and longer to recover. Warm water ocean currents are traveling further north, transporting more warm water into the Arctic environment later and later in the year. Atmospheric circulation has also changed. Large blocking patterns dredge warm air up from the south and deposit it in the Arctic. These same blocking patterns dump cold air, which once tended to concentrate in the Arctic, into temperate regions. The result of all this ocean and atmospheric mixing is that the Arctic is much warmer than usual and sea ice recovery mostly lags. In his Arctic Sea Ice Blog, sea ice blogger Neven has also pointed out that it is likely sea ice is also thinner now than ever before. 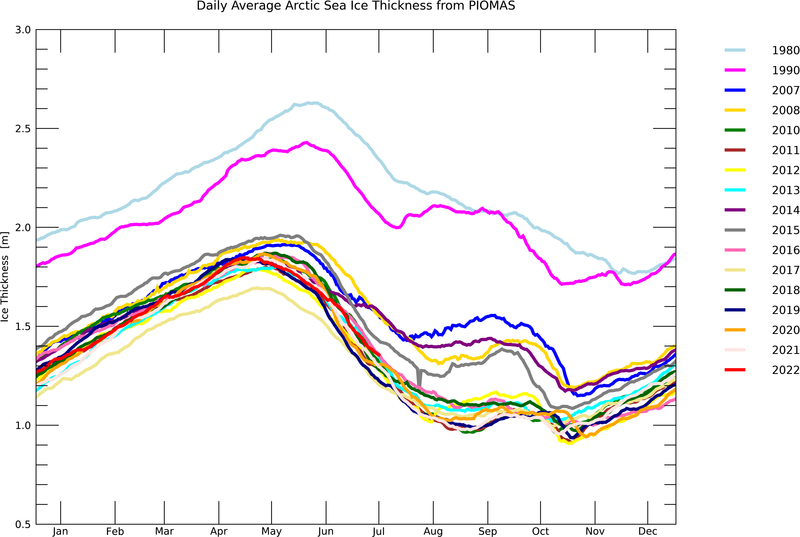 His rough graph combines PIOMAS volume and NSIDC sea ice area data to provide an estimate for average thickness. This month’s graph shows average ice thickness of less than 1 meter over the entire Arctic lasting through November 5th. Neven’s previous rough estimates had shown average sea ice thickness did not pass below the one meter threshold at any time since records have been established. This year, average sea ice thickness dropped below 1 meter on October 21rst and has remained at that record low level through to November 5th. Increasing scientific evidence and consensus points toward massively reduced sea ice area and volume resulting in chaotic and damaging weather patterns. Meteorologists and researchers from climate and weather disciplines have attributed Superstorm Sandy’s size, intensity, and path, to influences that have been made worse and worse by human caused climate change. 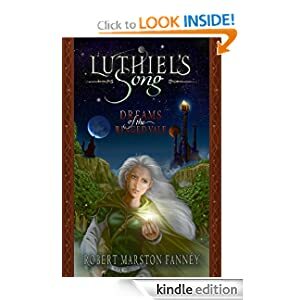 Furthermore, powerful blocking patterns that result from the deterioration of sea ice have been implicated in wide ranging weather extremes including the current historic drought, powerful heat waves in Europe, Russia, and the US, and extreme rain and storm events across the globe. In addition, receding sea ice kicks off a number of powerful global warming feedbacks that are likely to amplify human-caused climate change, heating the Earth at a faster rate. Loss of insulating sea ice also puts Greenland and West Antarctica at increasingly severe risk of increased melt. The result, in these cases, is much more rapid sea level rise on top of increasingly powerful storms. We are experiencing only the first outliers of these impacts now. So rapid reduction in greenhouse gas emissions can help to prevent the worst of a large pack of climate troubles now forming. Across the sea ice blogosphere today a great amount of discussion has been dedicated to the subject of sea ice volume. You can take a look at some of this discussion over at Neven’s Arctic Ice Blog. The general gist is that, for the past few years, the Arctic sea ice community has been cautious about accepting data from PIOMAS. The researchers there model sea ice volume by plugging Arctic Ocean observations into a computer simulation. However, over that time, the trends established by the PIOMAS data have born out in larger Arctic melt trends. This summer, a group of British scientists validated the PIOMAS findings by using satellite data from Cryosat2. Interestingly, these British scientists came to the same conclusion that many studies of PIOMAS data have pointed to — the Arctic Ocean could be ice-free at summer’s end within the next ten years. Almost as soon as the British published their Cryosat2 data, the Arctic began to experience another record decline in sea ice area and extent. The visible losses in extent and area have been, for many, enough evidence to take seriously the notion of a nearly ice-free Arctic in a much shorter span than was previously predicted. 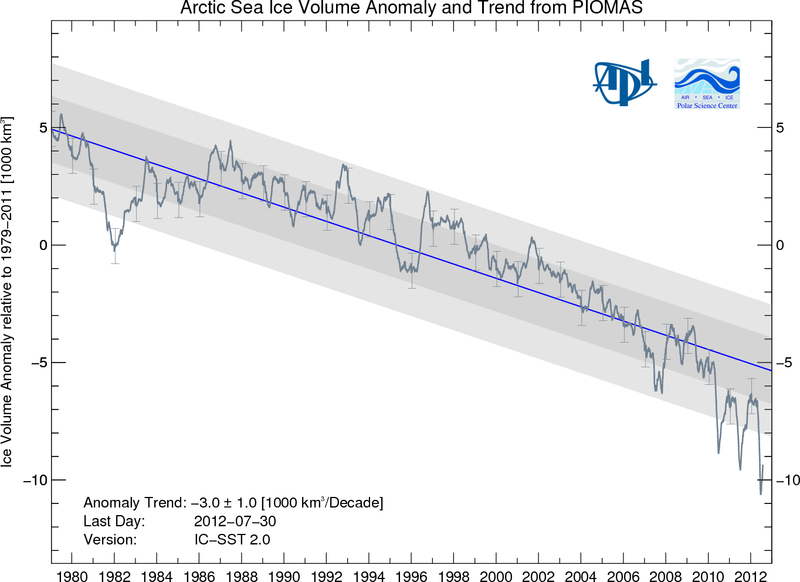 Given the increasing acceptance of sea ice volume data and of the conclusions that can be drawn by sea ice data trends, it is important to provide a brief summary of what the volume trends from PIOMAS have been. In short, what PIOMAS and Cryosat2 have revealed is a stunning loss of sea ice and a potential for the total loss of Arctic Ocean ice over a much shorter period than previously thought. 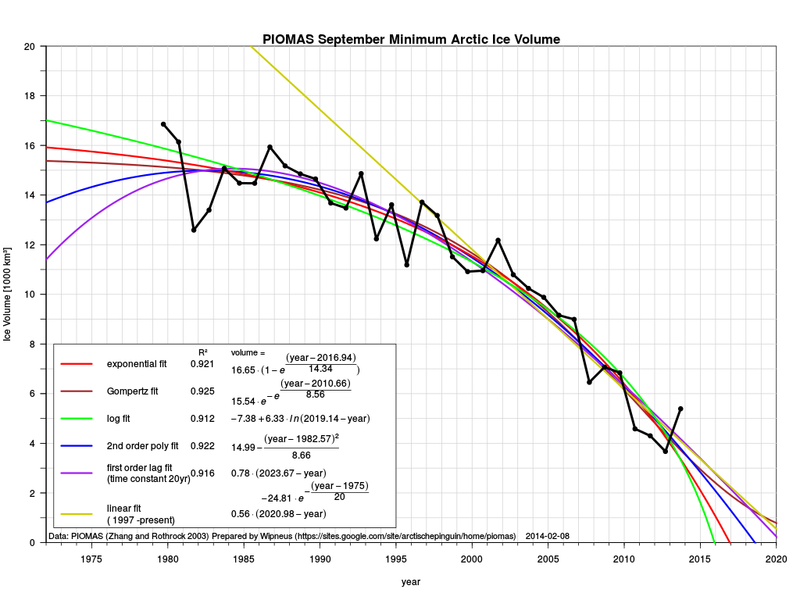 In 1979, the total volume of sea ice according to PIOMAS was about 16,000 cubic kilometers. 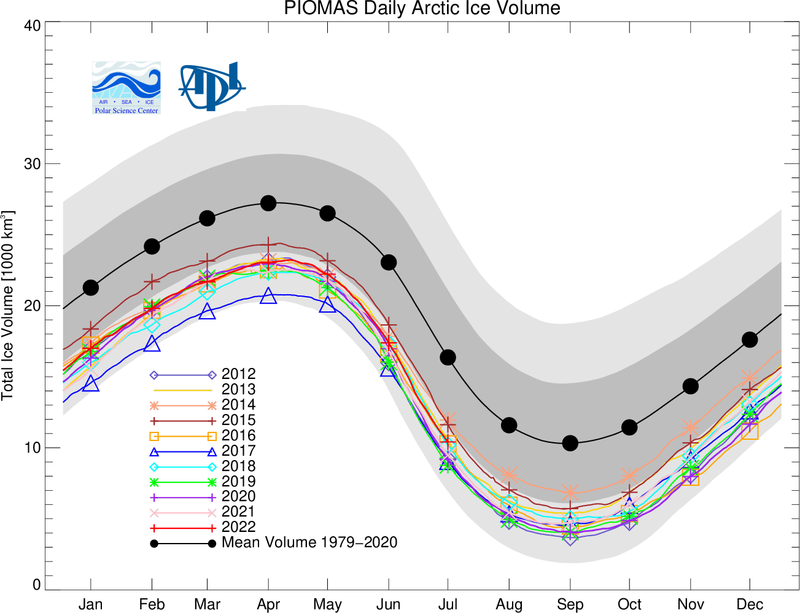 Today, PIOMAS shows sea ice volume at 3,600 cubic kilometers. This is a total loss of 12,400 cubic kilometers or about 78% of all ice in the Arctic Ocean at the end of summer since 1979. As noted before, at the current rate of melt, volume measurements indicate the Arctic could be ice-free within ten years. This is a curve fitting process. So any conclusions drawn from it should be taken in understanding of the limitations of curve fitting. The last data points are from 2011. Plugging in the values for August of 2012 would show a new volume low of 3,600 cubic kilometers — about 1,100 cubic kilometers below the 2011 measure of around 4,700 cubic kilometers. Final numbers for September 2012 aren’t yet in. Stepping back, however, you can see a pretty severe melt trend. 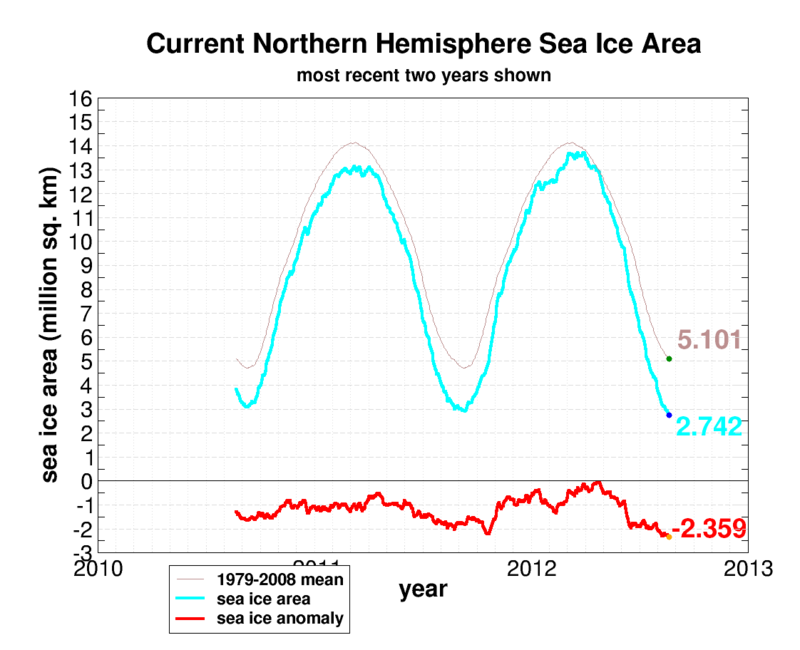 End of summer sea ice volume reaches about zero by 2017 following the curve. Even more disturbing, the Arctic becomes almost entirely ice-free year-round by 2032 if the trend lines for current decline rates hold. The only science team yet to validate the potential for an ice-free Arctic during summer within ten years has been those investigating the Cryosat2 results. 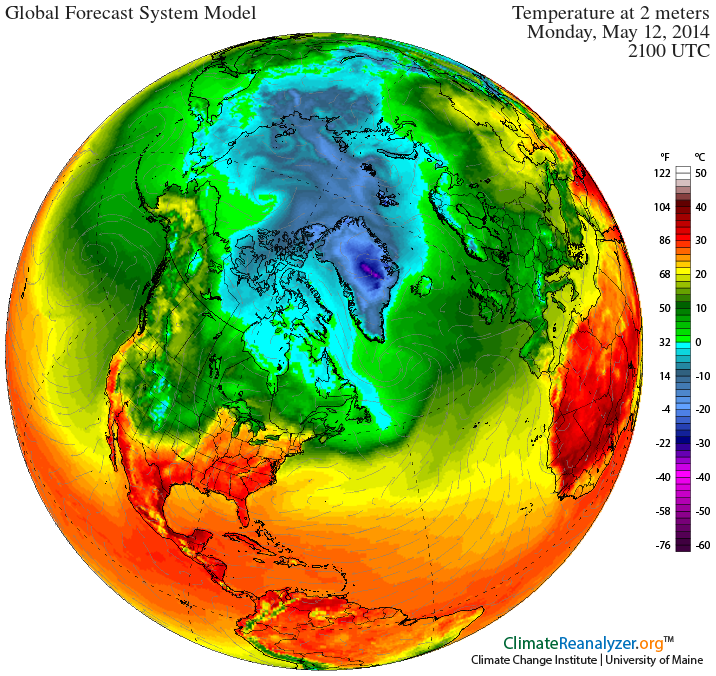 No-one has yet to validate the potential for an ice-free Arctic year-round by the mid 2030s. Yet this is the potential current melt trends reveal. It is astonishing to me that such information has received almost zero attention from mainstream news sources. A recent article in the Opinion section of the Washington Post noted the potential for ice-free summers in the Arctic within the next 30 to 40 years. If the volume trends hold out, this article will be a vast underestimation. Perhaps even more disheartening is the article’s conclusion which seems to celebrate the ice free Arctic Ocean while turning a blind eye to the huge masses of ice of Greenland and West Antarctica which are bound to be the next to melt. The writer seems to also be completely unaware of the massive volumes of greenhouse gasses stored in the permafrost and methane hydrates in the region. The same gasses which are bound to amplify human-caused global warming even further. I’m reminded of the irrational exuberance of economists and investors prior to the financial collapse of 2008. Even the bad indicators were considered ‘good.’ Let’s hope the derivatives of sea ice melt don’t come crashing down with even more terrible consequences. Lacking sound world-wide climate policy, a flimsy shred of hope seems to be all we have. Over the weekend, sea ice declined to new record lows hitting 3.71 million square kilometers for extent and 2.49 million square kilometers for area. In addition, PIOMAS showed sea ice volume has also reached new lows. Trends for sea ice extent decline has been especially pronounced this year with values now 524,000 square kilometers below the record set in 2007. The rate of extent decline is still very steep for this time of year. Usually, melt rates tend to taper off by late August. But we haven’t seen a gradual slowing of melt yet. 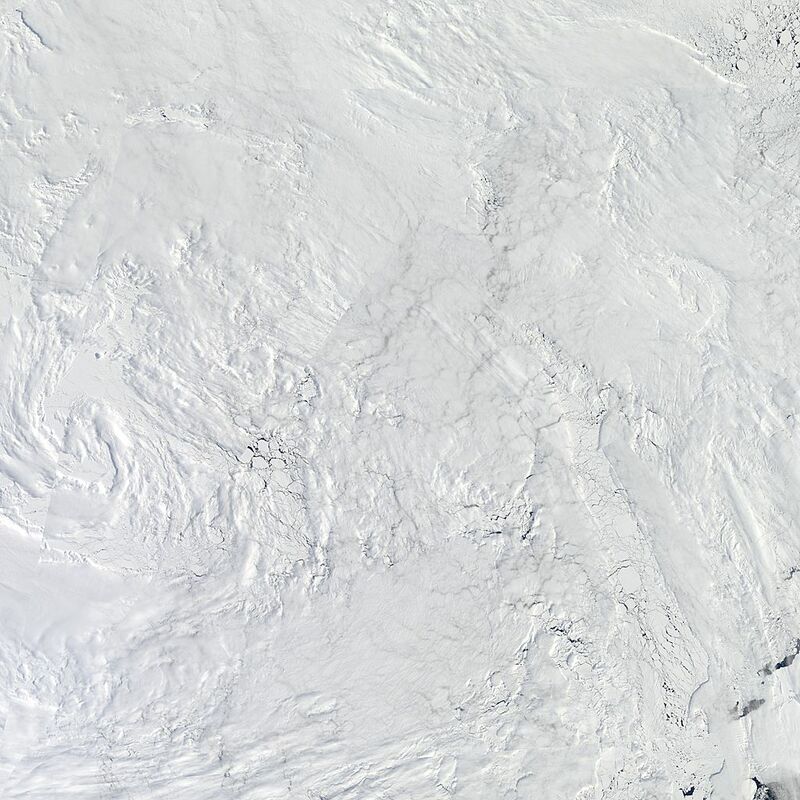 Looking at the sea ice from the satellite picture, we can see a large area of thick ice in the Laptev Sea surrounded by open ocean and thinning ice. It appears that, if melt continues in this region. This large chunk of ice may break off from the rest of the sheet. If this happens, it will be the second such detachment to occur this summer. Detached ice tends to melt quicker than ice connected to the larger mass. So this region may provide a final significant melt for 2012. In a previous post here, it was estimated that sea ice area could end in a range of 2.1-2.7 million square kilometers and that extent could end in a range of 3.5-3.9 million square kilometers. Current melt is now in the middle range of both of these measures and still falling. So it would appear that end melt will likely be somewhere near the lower range of estimates. If this happens extent and area measures will have been broken by about 700,000 square kilometers by end of season. This is what 32 years of human-caused climate change does to a polar ice cap. 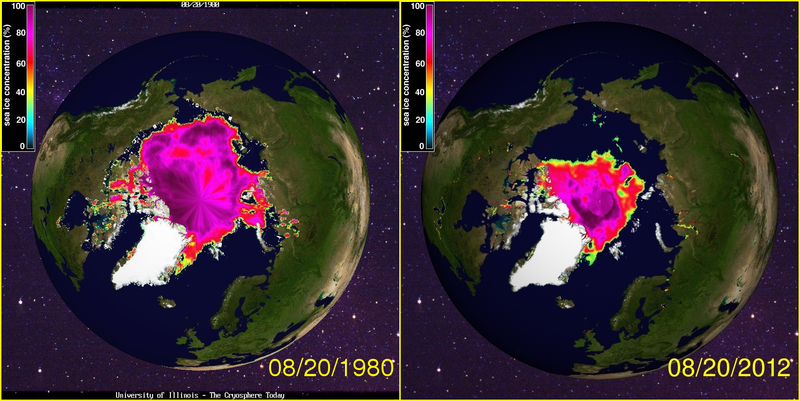 The first frame shows polar sea ice from August 20th of 1980, the second frame shows polar sea ice from August 20th of this year. The precipitous fall in size is horrific. Many in the climate community are calling it a ‘Death Spiral.’ And I think that’s a very apt name for what is happening to our ice cap. 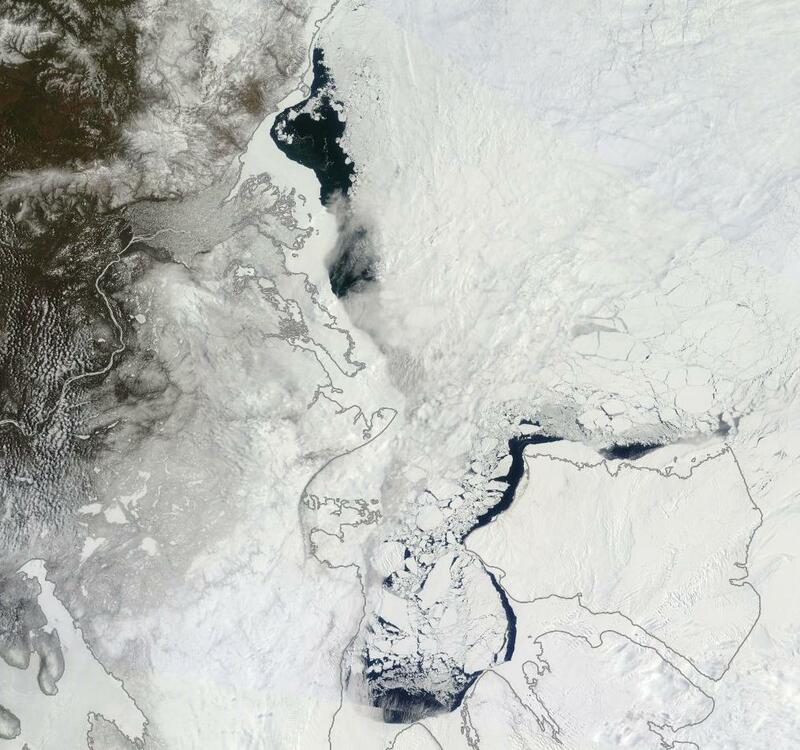 Today, sea ice area records reached a new all-time low of 2,742,000 square kilometers. This is 163,000 square kilometers below the previous all-time low. At the current rate of melt, we are on track to fall somewhere between 2.1 million and 2.6 million square kilometers of sea ice area by the end of this season. Since this season has shown such a rapid rate of melt, all bets may well be off for the final number. Sea ice extent also continued its rapid plunge with the Japanese Space Agency (JAXA) showing a loss of 80,000 square kilometers from its extent totals just yesterday. 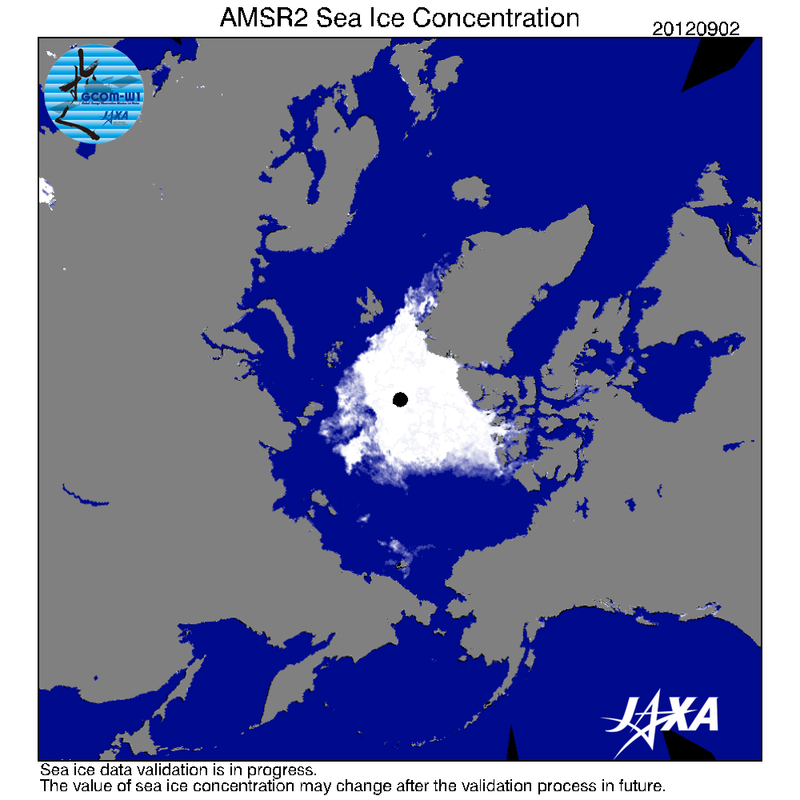 The current total for sea ice extent, according to JAXA, is 4,405,000 square kilometers, this is about 230,000 square kilometers above the all-time low. Given the current rate of melt, JAXA will likely see a new record set within the next five days. NSIDC is also showing a rapid fall to a new record low for sea ice extent with values coming in very close corollary to those provided by JAXA. So given the current rate of decline, we will also expect to see new records within five days from NSIDC, should melt rates hold. It is worth noting that the pace of sea ice decline for these observations is still very high. If the season follows typical trends, we should begin to see numbers slowing their rate of decline within the next couple of weeks. However, since weather conditions in the Arctic continue to favor melt and consolidation of the sea ice, it may be possible that we maintain steep melt rates longer than for a typical year. Current rates of melt would appear to validate Neven’s projection and, if they hold, not most, but all records are likely to fall. Last of all… Many of you may be wondering why mainstream media hasn’t picked up on the record melt currently underway for Arctic sea ice. Part of the reason may be that there are a diversity of monitoring sources. Generally, primary media sources have used the NSIDC measurement as their baseline. So, as Joe Romm notes in his most recent ‘Arctic Death Spiral‘ article, mainstream media will likely pick up the story of this year’s record melt once the NSIDC record is broken. While much attention has been given to yearly measurements of sea ice area and extent, the Polar Science Center has been keeping track of another key figure: volume. And while extent and area has tended to fluctuate along an overall downward trend, sea ice volume has been in decline year after year for many years running. 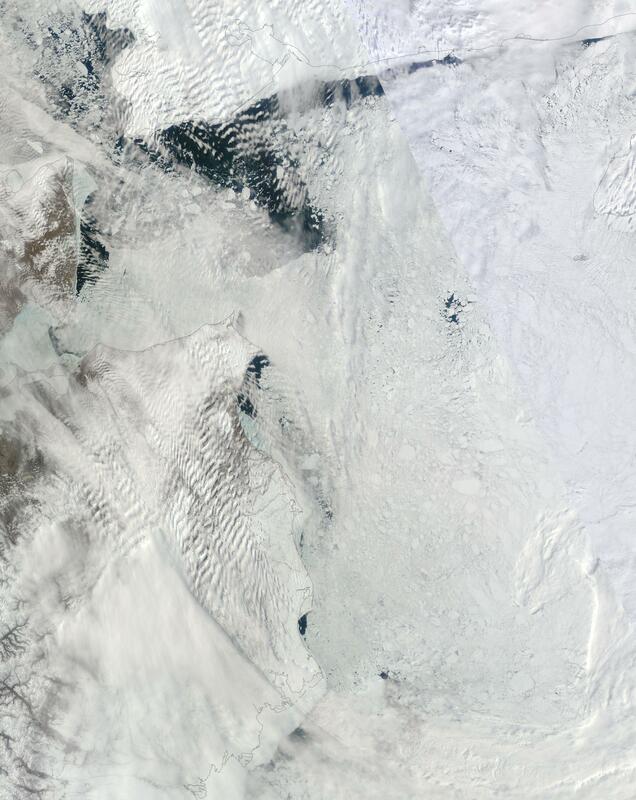 Area and extent are both measures of ice visible from above. Volume, on the other hand, adds in thickness. 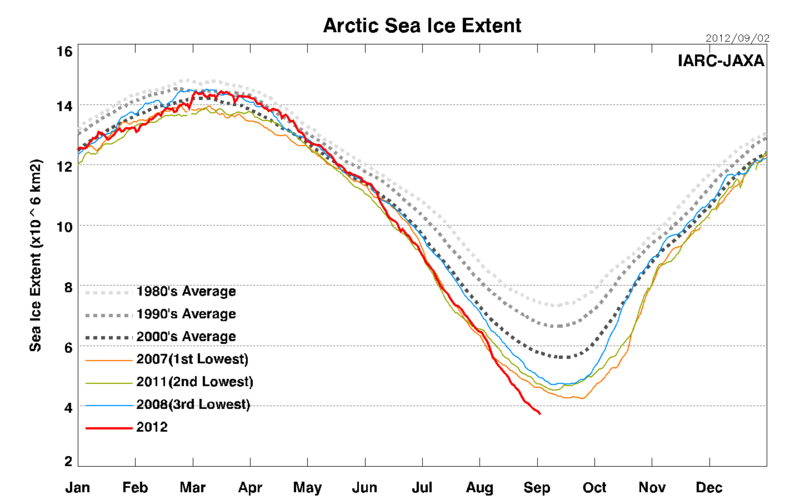 And what we’ve seen over the past decade is that the ice in the Arctic is growing very thin indeed. This year is no exception. Data from the polar science center has shown that summer volume measures have continued to decline from the record lows set last year. And, unless the rate of decline begins to abate soon, sea ice volume may approach zero during summer before the end of this decade. As you can see from the graph below, volume losses are even greater than what would have been expected from trends established before 2005 and current lows are well outside the range of statistical deviation. Anyone keeping track of sea ice as a measure of climate change impacts would be wise to keep an eye to volume measurements as well. And the Polar Science Center currently provides the best data available.